Hundreds of people continued their protest Saturday night in Tel Aviv, long after the official housing protest rally ended. Demonstrators blocked the city's Kaplan and Ibn Gabirol streets, chanting "The people demand social justice." A large police force, included the Mounted Police, secured the demonstration and did not attempt to disperse the activists at first, but as the hours went by and the activists refused to disperse peacefully, the police declared the gathering illegal. Tel Aviv District Police Commander Aharon Aksol said: "We allowed protesters to rally and express themselves, but now several dozens are blocking the intersection. It's a shame that they are taking away from a 60,000-people rally that was orderly." Around 1:30am, after failing to negotiate a peaceful end to the rally, which showed no signs of winding down, the Tel Aviv police began forcibly dispersing the protesters. Central Control Unit officers formed a human chain in an attempt to push demonstrators back and break up the clusters of people blocking the road. The protesters began booing the officers and chanted "No, we won't go," and "Police state." Several protesters rioted and 12 were detained for questioning. 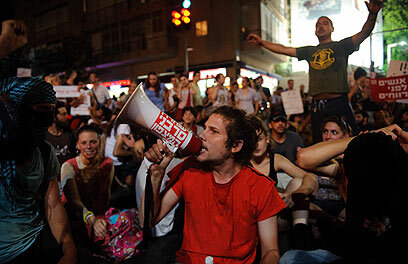 See all talkbacks "Tel Aviv: Protesters clash with police "